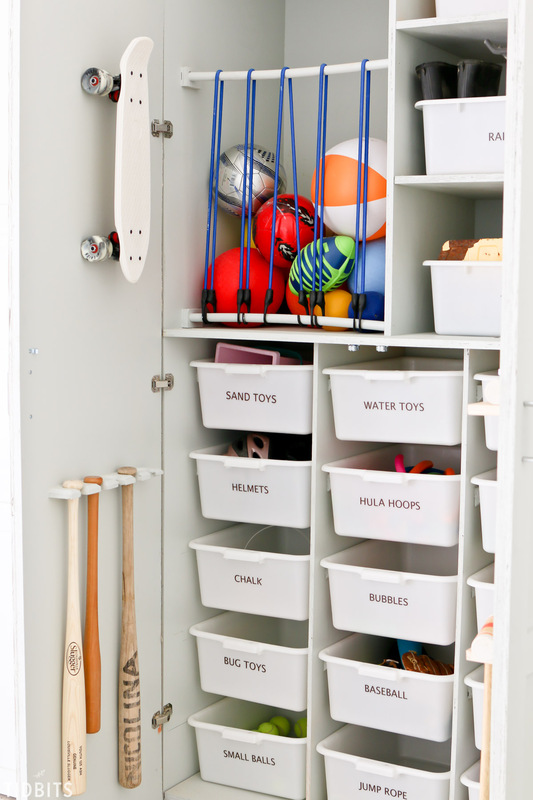 If an organized space makes your heart giddy happy, boy do I have a good one for you today! 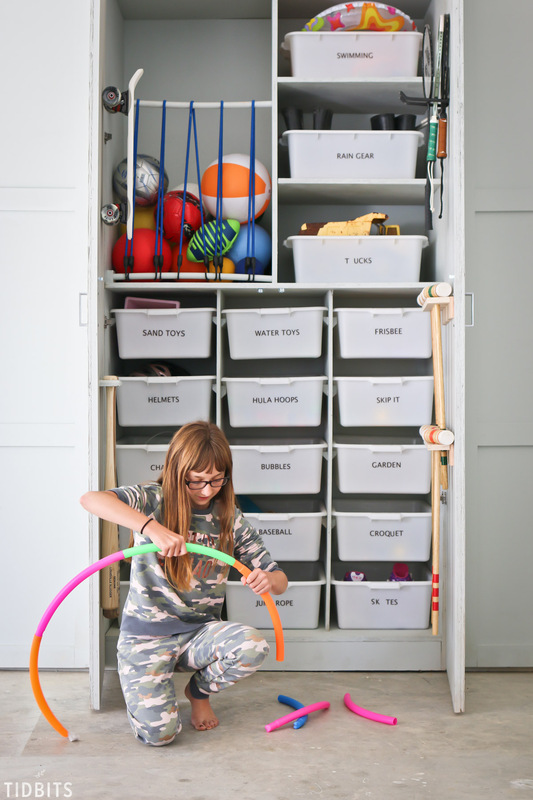 I finally found a way to love all my kids outdoor toys and it just took creating a garage toy storage and organization cabinet. 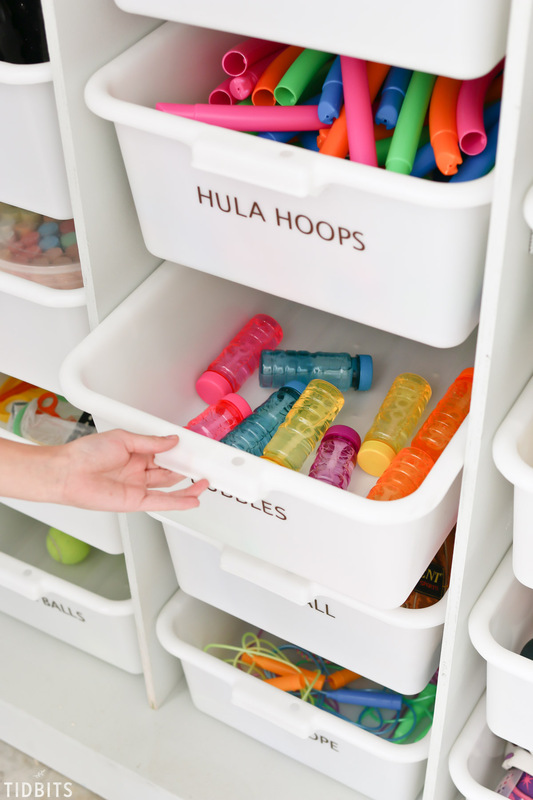 Read on for some fun toy organization ideas! 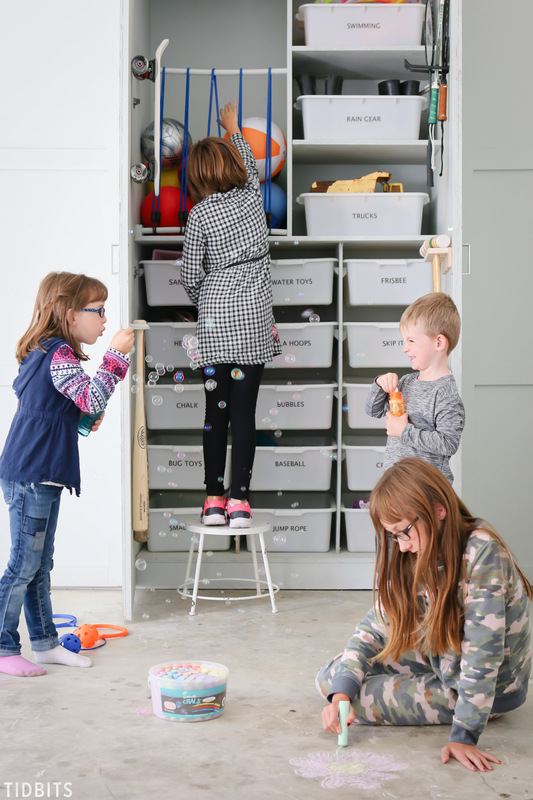 True, I did buy a few new special items to treat them with for this toy garage storage cabinet, but in truth, they just discovered the joy of having all their beloved belongings nice and neat in a space where they could see them to play and easily put them away. Let’s recap quickly how this garage makeover project has progressed. 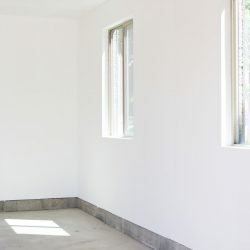 First, we painted the walls. 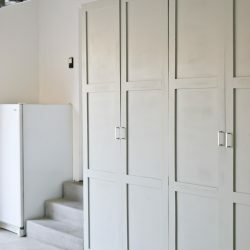 Second, we built tall cabinets and shared the building plans with you. 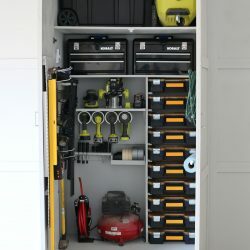 Third, we organized and built a place inside one of the cabinets for my husbands tools and “stuff”. 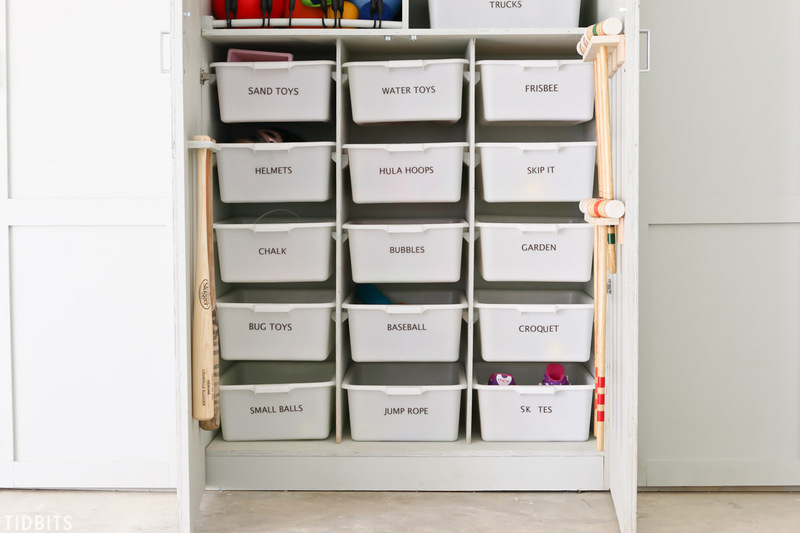 Now, we have successfully organized a place for all my kids outdoor toys and hopefully will never again find ourselves digging around for them in some spider infested corner of the garage. Can you hear my Hallelujah’s? 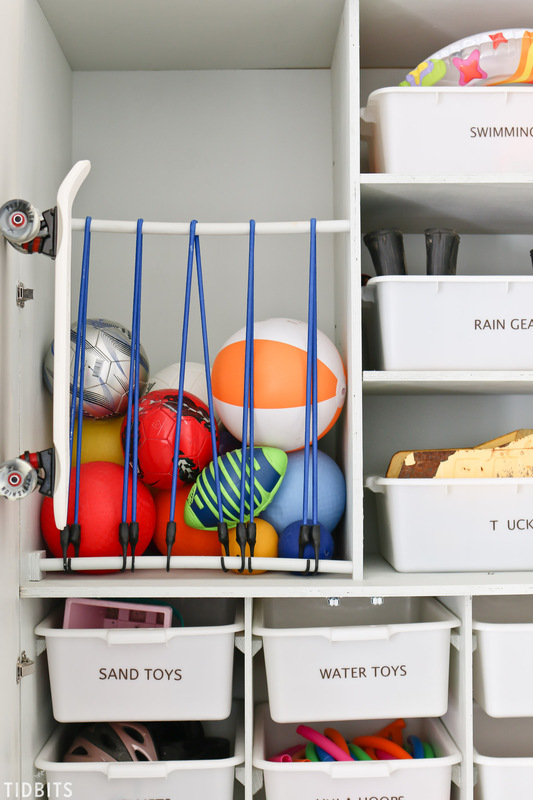 I truly hope this post will give you the motivation and some inspiration for ways you too could organize a designated space for all your outdoor toys. I probably couldn’t count how many balls I have ran over with the car because the kiddos would leave them bouncing around the garage. 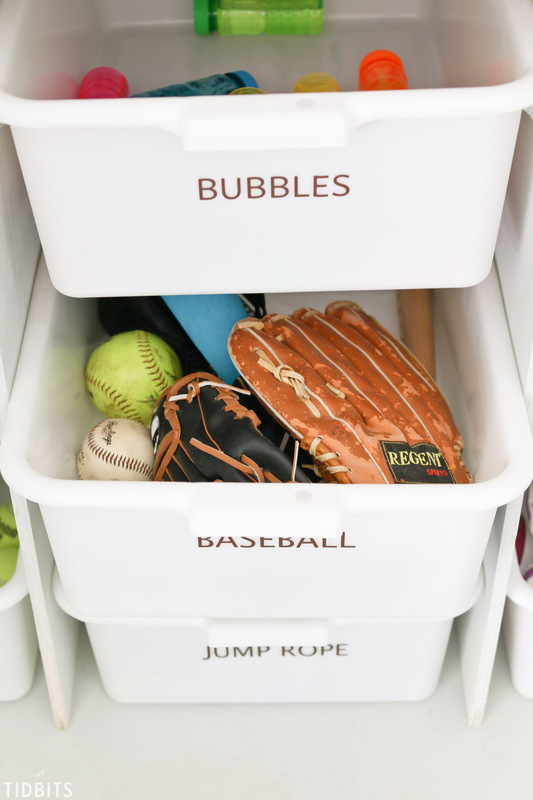 I knew we needed a place to easily store balls and keep them from their untimely death. My husband did this well by simply using bungee cords looped around some dowels he installed inside the cupboard. 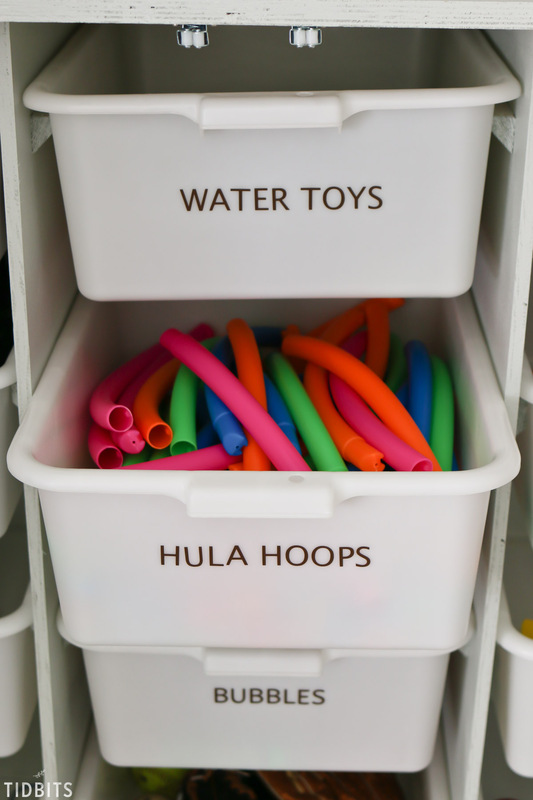 They are easy to pull out and easy to put away. 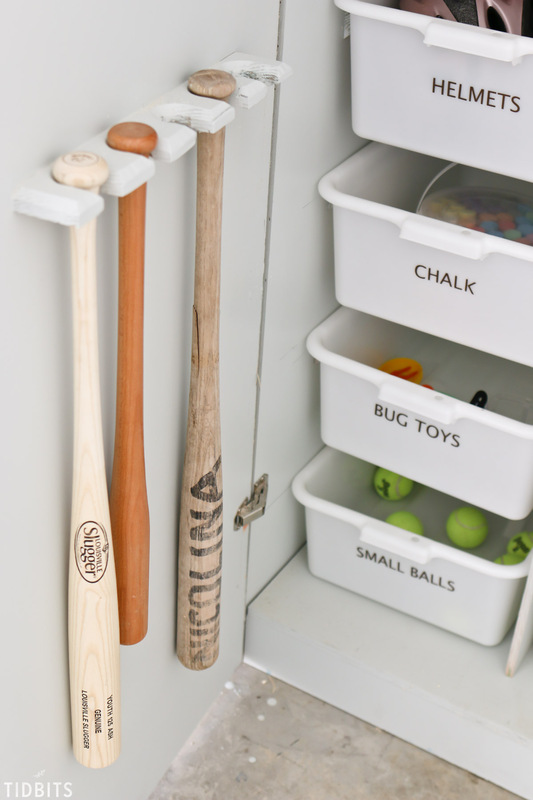 I’ve been collecting old and some new wooden baseball bats, and Mr. TIDBITS again had the best idea to notch out some holes on a board with his router and attach it to the door of the cabinet. 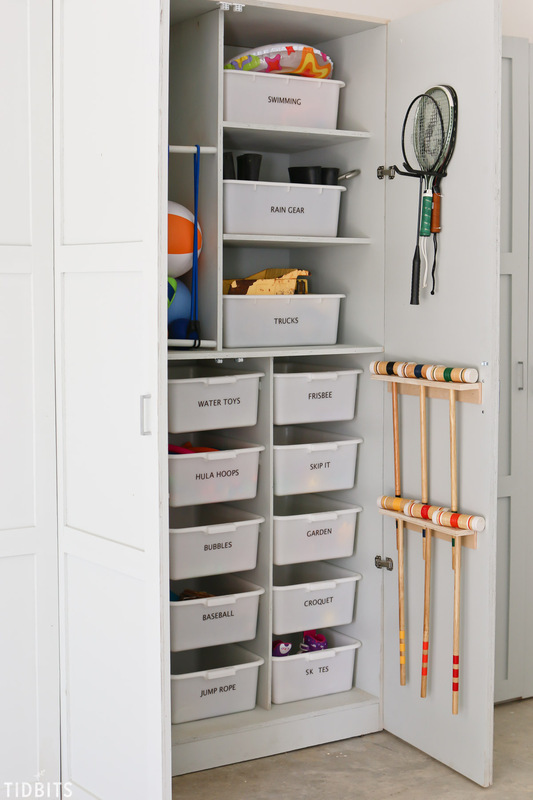 While he was at it, he installed some boards on the other door to hold all the croquet sticks, where our kids can easily take out and put back in. The rest of what we had we figured could easily fit inside some wash basins or plastic totes. I’ll link to everything we purchased below. We found the right tote for the right price and my husband built the shelves around them. They simply rest on angled strips of wood and can easily be pulled out and put back in. I used a my vinyl cutting machine to label each tote with its belongings. 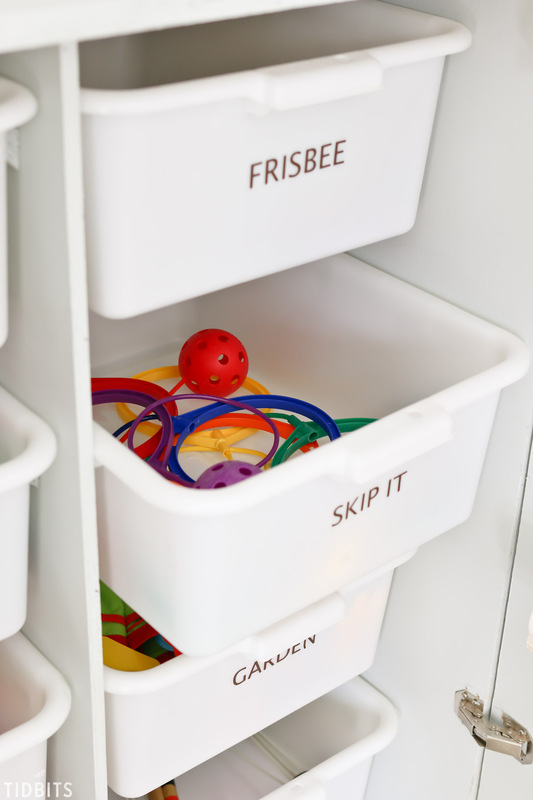 So far, the kids have been able to correctly clean up after themselves from the hours of fun they have had from this toy cabinet. 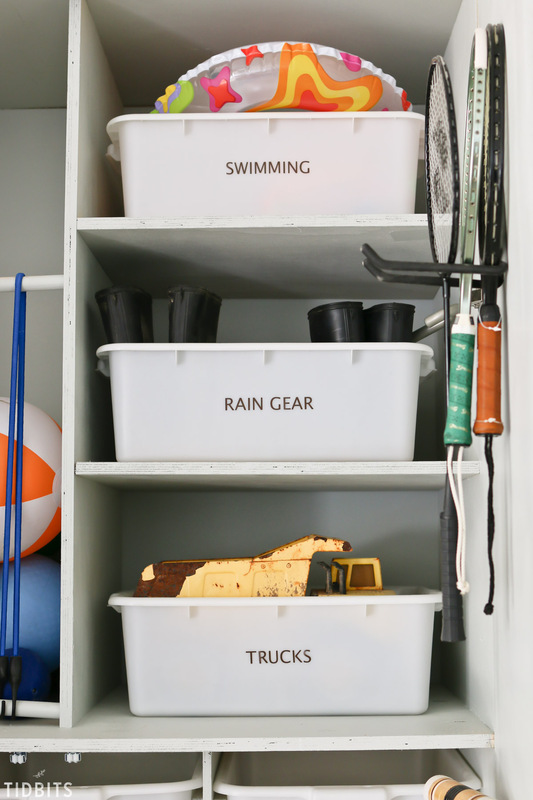 It’s amazing what a little organization and labeling can do to keep a home nice and tidy. Before we even got started, I sketched out all the items we had or I thought we would eventually need to store. 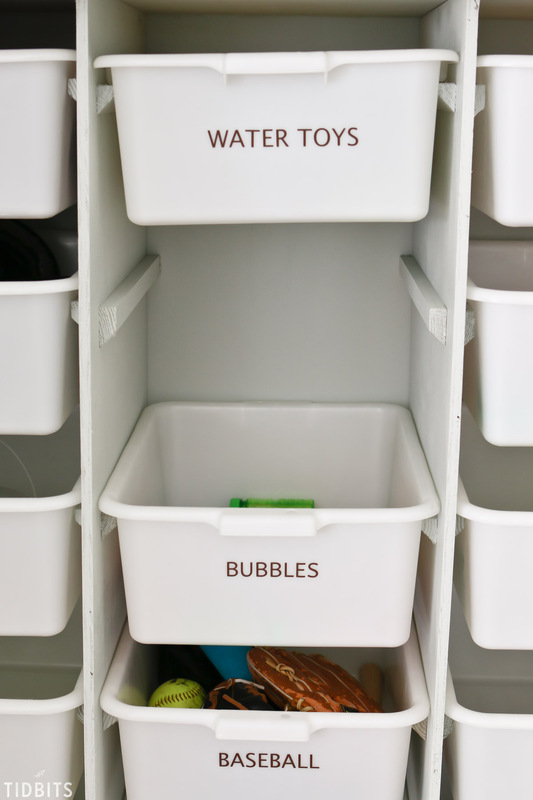 Some of the totes have way more room to fill, and it will be easy to switch out contents as our needs for storing other toys change. But for our family of littles, they seem to have everything they need for hours of outdoor entertainment for now. 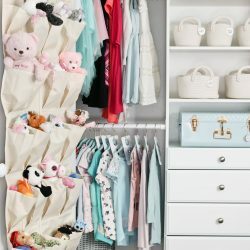 I can’t help but think this same toy storage system would also be heaven sent inside the home as well. I’m brainstorming ways to build this into our future home someday. I hope you’ve enjoyed seeing inside cabinet number 2! For the final 2 cabinets we plan to designate one for our common outdoor supplies (think camping chairs, coolers, etc.) and the other for automotive/paint supplies. 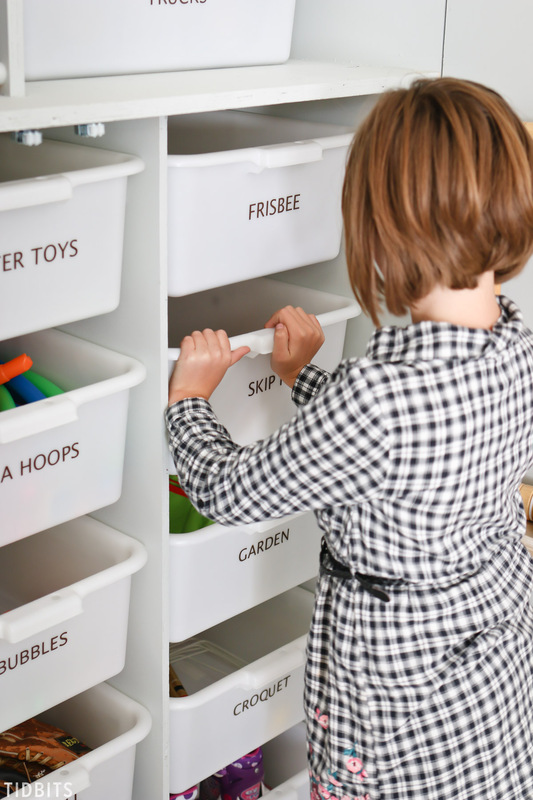 We are having so much fun thoughtfully planning out the insides of these cabinets to suit our needs for years to come – and truthfully, taking our time to do it right. 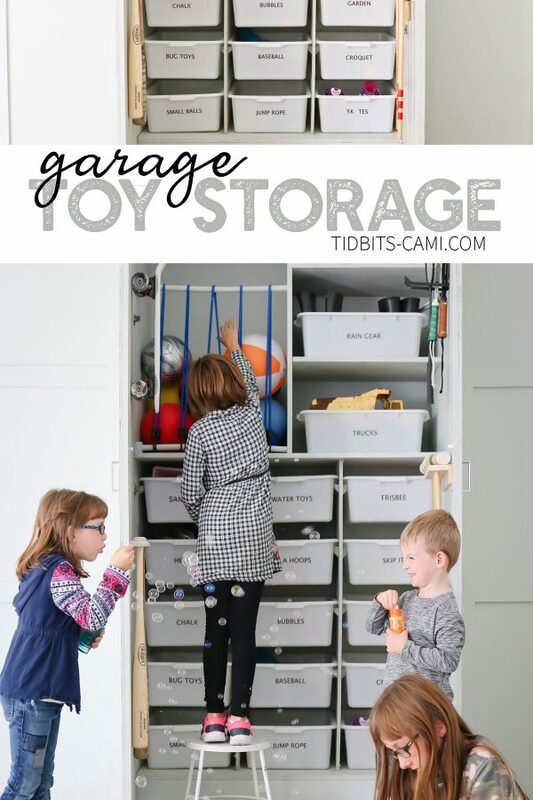 I’d love to hear what you would store inside some garage cabinets of your own! 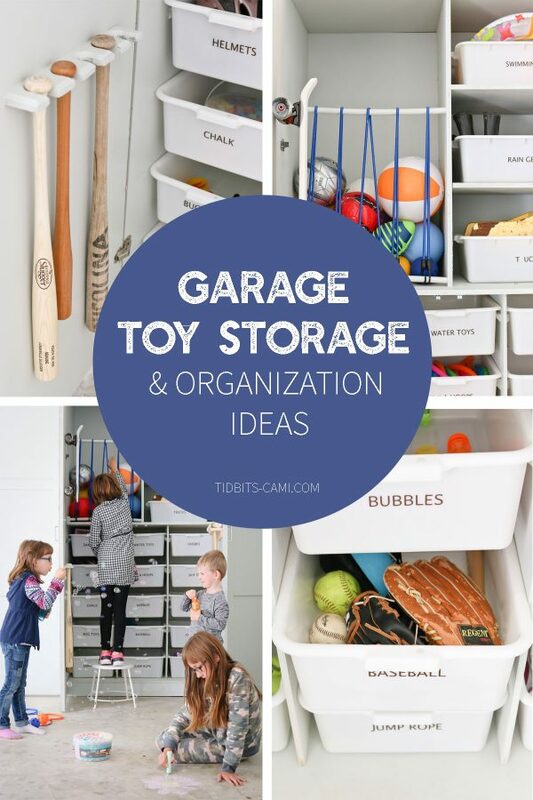 Perhaps you’ve thought of a garage storage need that I haven’t. Let’s hear it in the comments below! 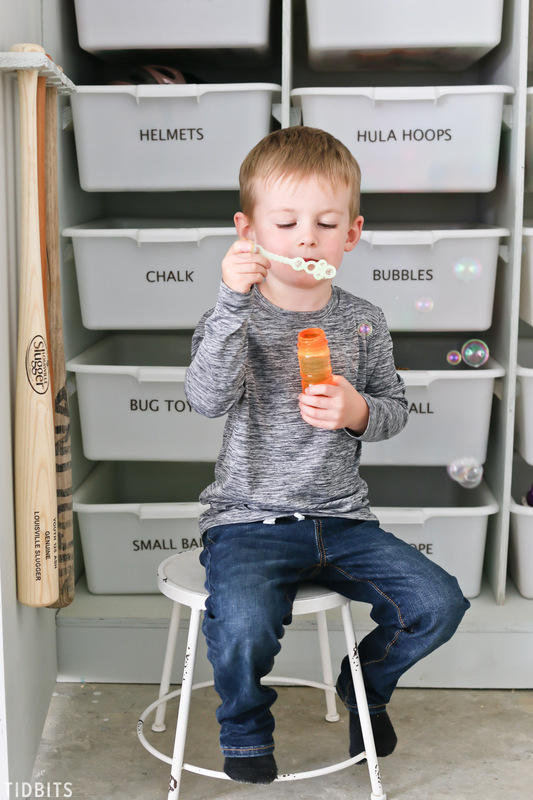 I hope you’ve enjoyed these ideas, and I’ll leave you with a list of sources and a happy happy boy blowing his bubbles. *Affiliate links below. For a better visual representation, visit my Amazon Storefront. Technically called “bus boxes”, when we discovered these they were about half the current listed price – making them a screaming deal. So we bought 24 of them. Sorry – they must have caught on. Such a treat! And I have to tell ya, they didn’t complain one bit about this photo shoot. I just had to say, “kids! Come play with your toys!” And they came running 😉 . Thanks so much for visiting! Wow 😮 you really got it going on! Looks great! Also, I love the middle girl’s haircut 💇. She looks so mature 😊. 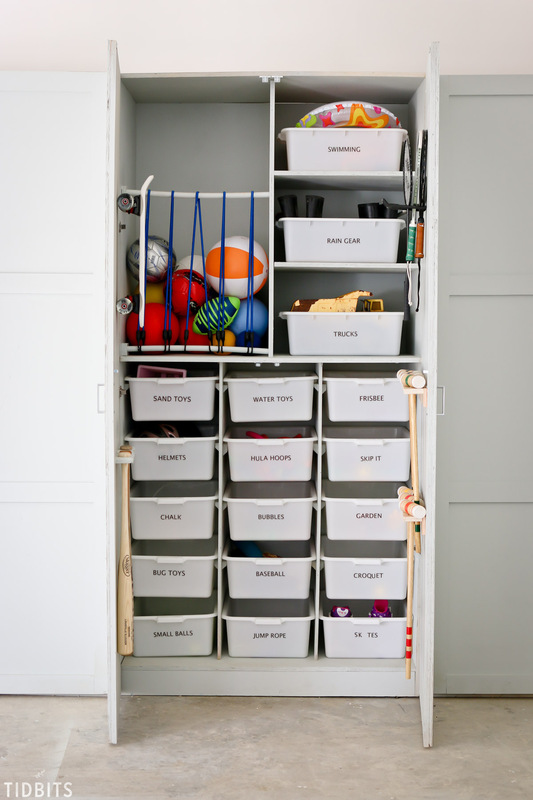 Very cool storage idea! Pinning for use in my husband’s new shop/garage! Do those hula hoops work pretty well? My daughter likes to take hers when we go camping, but it’s always so awkward to store. 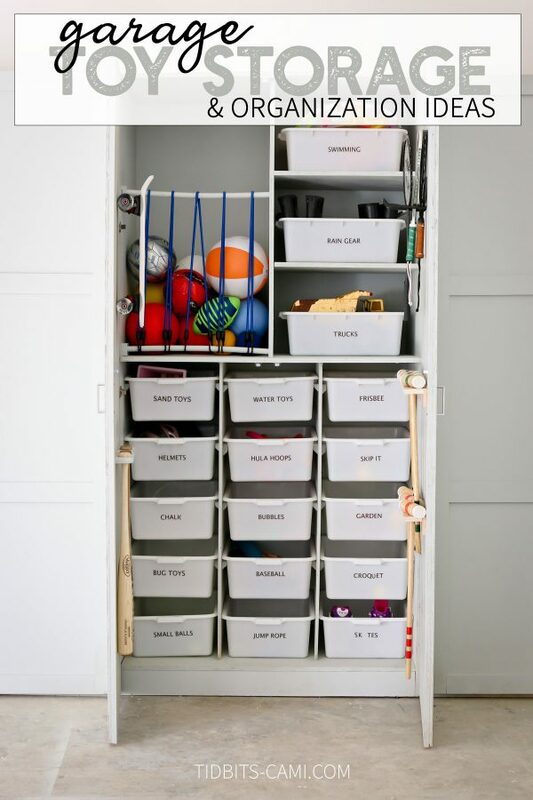 This is probably one of the best toy storage I have seen. It is for toys but doesn’t look too childish. And on top of that, it will go with any modern day decor. Abby recently posted…45+ Interactive Toys For kids from varying age groups! Amazing!!! 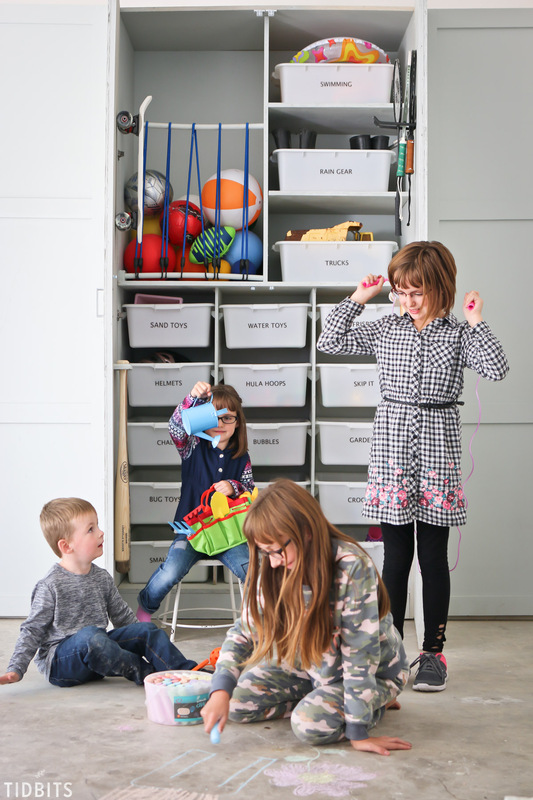 LOVE this whole garage organization. I would LOVE to be able to put my studio in the garage. 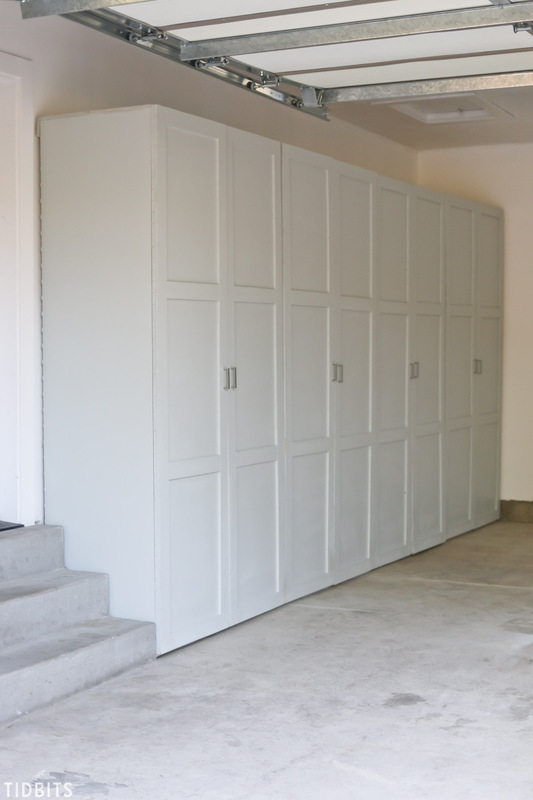 One question… where do you store bikes?